While Malabar Hill Citizens' Forum (MHCF) has been fighting to save the Priyadarshini Park on Napean Sea Road in Malabar Hill in South Mumbai, children of the area have come forward in a big number to support their seniors. 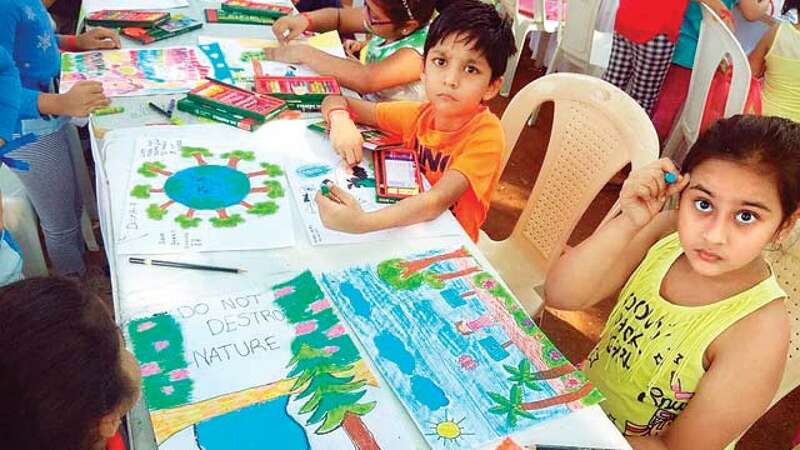 Over 450 children participated in a painting competition held early this week to save the Priyadarshini Park. The Bombay High Court had given temporary thumps up to the Malabar Hill residents by directing the Mumbai Fire Brigade to remove fire engines parked inside the park. However, the residents under the banner of MHCF continue their fight. Susieben Shah, the secretary of MCHF, said the painting competition was a huge success as over 450 children participated in it. "The children showed how much they are concerned to save the Priyadarshini Park." The theme of the painting competition was "Save PDP, Save the Environment and Open Spaces". Paintings which received big applause was 'My Life My Park' and 'PDP - Let it'. Shah said though they have received a temporary relief from the court, they shall continue with their fight. "It is more than three decades that the park has been developed and maintained by residents and, now, we can not allow anyone to ruin an open space," Shah said. The Bombay High Court had come down heavily on the Brihanmumbai Municipal Corporation (BMC) for not complying with an earlier order directing that status quo be maintained. The civic body had set up a temporary shed for parking fire engines inside the park. The Malabar Hill Citizens' Forum has not only been fighting a legal battle against the proposed fire station at the park, but also began a signature campaign and managed to garner the support of at least 17,500 citizens. However, the temporary fire station set by the BMC has received around 29 fire-related calls in just two and half months. According to BMC, as per the standing fire advisory council, for every area having a population of 50,000 people including a cluster of buildings, one fire appliance is required. The areas of Malabar Hill, Bhulabhai Desai Road, Napean Sea Road, Walkeshwar are densely populated.